A calendrical martyrology is used to record people's names and the dates of their death, so that their souls can be prayed for on each anniversary of their death. Gaps are left for the later insertion of more names. 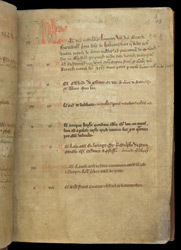 Two of the entries on this page refer to men as 'abbot of this place', which, combined with the known biographies of other people mentioned, allows one to deduce that the calendar belonged in the Middle Ages to Beauchief Abbey, a short distance to the south Sheffield.